As soon as you open the door, the aromas will hit you like an invisible wall. You don't walk into The Red Pot, you wade in, like you're swimming through a sea of smells. If there were such a thing as smell-imaging, waving your arms would show the turbulence your presence has on the environment--a room filled with the thick, delicious odors produced by dozens of steaming, gurgling pots that might as well be cooking up potpourri. Customers leave reeking, ripe of curry, spices, dried fruit and herbs. The dew that dots their brow either perspiration or condensate from the billowing steam of whatever they were boiling. Everyone exits rubbing their stomachs from a meal well eaten and slurped. 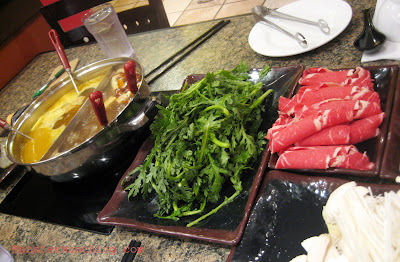 The Red Pot is the very new Mongolian hot pot restaurant that replaced the old hot pot restaurant called Four Seasons. The new entrant and the recently departed served essentially the same food, but they couldn't be more different. The service at Four Seasons barely existed because the owner was practically deaf in one ear. The Red Pot is staffed by the second generation--youthful faces who are attentive and are fluent in English as they are on customer service. Of course, they're on Facebook. Also The Red Pot is an all-you-can-eat for $19.99. This frees the individual to try new things one might be hesitant to spend money on otherwise. AYCE here is a license to explore. And there's a lot for the itinerant explorer to discover beyond just chicken. There's pork blood cubes, tripe, intestines, even tendon, which cooks down to chewy Jell-O. You order the things you'll boil from a list of meats and veggies that has the check boxes in three columns for each "round". You check off what you want and servers bring it out nicely presented, ready for boiling in a flavored broth of your choice. No one I know has made it to that third column. My dining partner (the esteemed C. Thi Nguyen from The Los Angeles Times) and I barely made it past our second round of meats and before we tapped out. Imagine if I asked for rice. Key to the experience is the broths. Those who would pooh-pooh shabu shabu for plainness will be forced to reevaluate their positions here. Mongolian hot pot is anything but plain. The cooking liquid is often spicier than most ready-made soups, some with a red oil slick that finds and clings to meat like pieces of metal to a magnet. And then there's the sauce station, where a virtual painter's palette of chili paste, oil, and soy begs to be blended into unique dipping concoctions. The beef isn't as meltingly tender here, but the lamb is immaculate. Squid balls puff up in the heat to the fluffiness of cotton. Inside the springy spheres hides a chewy cube of real squid. Ton ho, the snappy green that looks like a common garden weed, bites with a refreshing peppery note, swabbing the decks so that the palate is cleansed for the next mouthful. And since this is an AYCE, you will have many more mouthfuls. Budget at least two hours worth of time in this steamy, sweet-and-spicy smelling sauna. Save the shower for after your dinner. *To read Brekkie Fan's review of The Red Pot, click here. I will definitely check out this place. You know Elmo, whenever you review a place it EXPLODES a week later on my Facebook newsfeed via my friends and Yelp. You know all the best places before they become big! I love this place. Just went about 2 weeks ago. 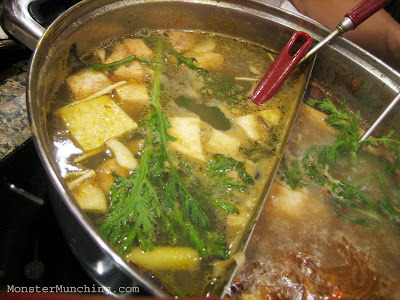 The spicy herbal broth was so good. I like their house special dipping sauce a lot, too. It cost about the same as shabu shabu, but a much better value in my opinion. Definitely will be back again very very soon. Drooling already from this post! 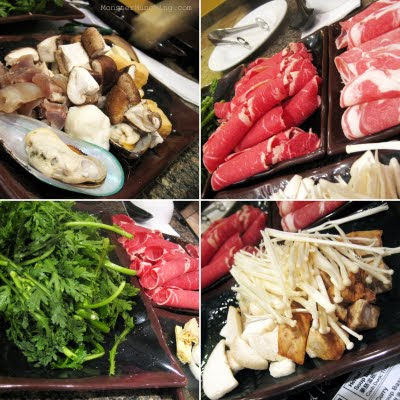 I especially like that it's an all you can eat for a set price deal, for it's hard not to splurge on hot pot :)! Are there a variety of different soup bases? "whenever you review a place it EXPLODES a week later on my Facebook newsfeed via my friends and Yelp." That's good news that people still read my blog, and bad news when I want to go back to the restaurant! I'm glad! I want Red Pot to survive and thrive! True! This place is quite cost effective! Little Sheep has been a favorite of mine, but the a la carte can get very, very expensive. And though I love shabu shabu, there's really no comparison in flavor although they're pretty much equal in price. Yes! There's a choice of at least 6 soup bases. We took the curry and the hot soup. But there's also a white soup and a few more that I'll have to try the next time!